Create an adventure that plays into your passions, outdoor knowledge and local access. Make it fun, original or multi-faceted. Do your best to include captivating photos, a thorough description and any extras or amenities to your adventure. Not only does this help our team approve your adventure in timely manner with little or no updates needed, it also helps set clear expectations of what's included. Separate your adventure from the rest by adding a captivating name. Keep the title short and sweet (1 to 2 lines) will make it more eye catching and easier to read. Choose 1 to 5 photos that best represent your adventure. Learn more about our Photo Guidelines below. What to bring, meeting location, and a thorough description of all elements of your adventure should be clearly stated in the details of your adventure. Being thorough in your description helps participants know what to expect on your adventure. Outline the itinerary from start to finish. Double check your work before submitting to make sure you don't have any grammar or spelling errors. If you need help with your description feel free to reach out to the Adventure Aide crew through the in-app messenger. Determine what participants should bring or wear in order to be as comfortable and prepared as possible. How long is your adventure? Choose between one day, overnight, or multiple days. The higher the price, the more detailed your description should be. This helps participants know exactly what they are paying for. For suggestions on how to price your adventure, check out the Pricing Guide below. Require participants to supply their own gear. If you are looking more for people who share your interests, this may be the way to go. You could also encourage those who don’t have their own gear to rent ahead of time. Rent gear from a local shop beforehand. You will have to factor the rental cost into your adventure price, but renting additional gear is a way to increase the number of participants you can take on your adventure. Invest in your adventure! Whether that means purchasing more gear for your adventure, or making a deal with a local rental shop to get discounts, going the extra mile as an Aide will make a difference. Choose an obvious and accessible location for meeting up with your adventure participants. If parking is an issue, make sure to include the necessary information in your description. The Adventure Aide Crew reviews each profile before being approved. We want to be sure we are a good fit for each other and ensure you uphold our core values. You can expect to hear from us within 48 hours with next steps or if any updates are needed. Learn more about the approval process in the guide below. 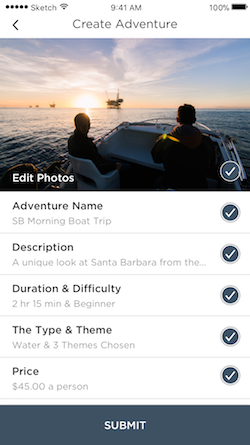 You can easily update your adventure description or adventure photo at any time! However, if the details of your adventure change significantly, it’s required that you create a completely new adventure to maintain the integrity of the app and your respectability as an aide. You can add as many different adventures as you would like to lead! 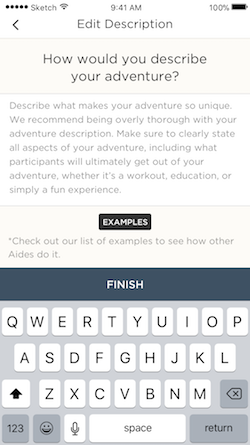 Each new adventure you submit will be reviewed and approved by the Adventure Aide team before going live on the Adventure Aide app.